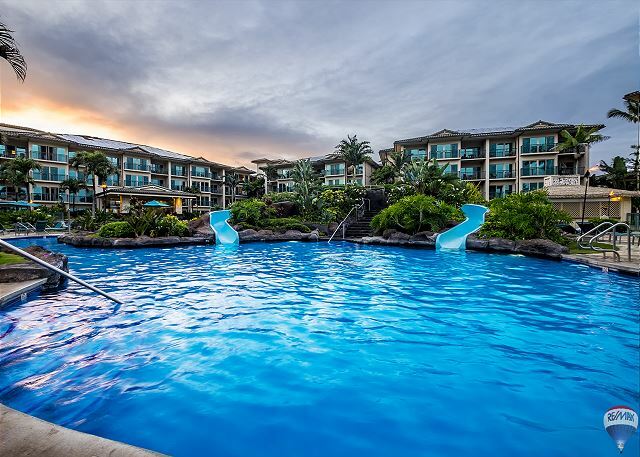 This resort has all the modern-day amenities that you would expect in a Five-Star resort, including a lazy river-style, saline pool with two water slides and travertine deck, three sandy bottom jacuzzi spas, children's sandy beach pool. Exceptional Oasis on the Beach Restaurant and Spa by the Sea Day Spa services are located on-site. Across the street from Starbucks, grocery stores, outlet shopping and restaurants. 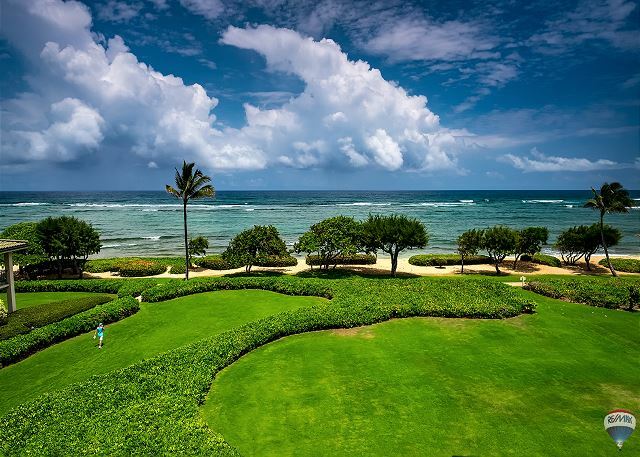 As a guest at Waipouli Beach Resort G-404 & RE/MAX Kauai, you'll have access to Kauai's Premier Concierge Service at (855) 665-2824 http://kauaiva.com/index.html, we will help you build your perfect vacation. The unit was well equipped with numerous amenities. The beds were comfortable. The only issue was the sliding glass doors and screens are very hard to slide open and the washing machine leaked when in use. 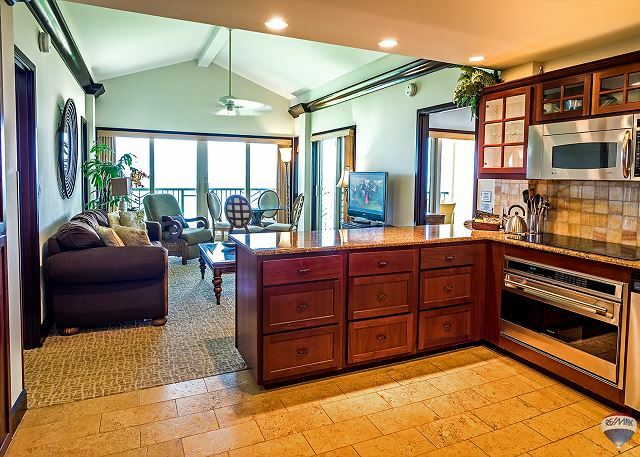 The Best Condo in Kauai!!!! We researched the whole island to find a condo on the beach with ocean views! This condo was better than what we expected! It was centrally located so we could get to Poipu or Princeville quickly. It was also nice to have shopping nearby. The best part is that Cocunuts restaurant opened a location in the shopping center behind it...they have the best clam chowder! Remax was very accommodating since we were anticipating that our flights were going to be delayed, since our airport was shut down due to weather. They worked with us to stay another half day. I would prefer to work with a professional company like Remax versus a personal owner. I would recommend this place to our friends and family! Love Kauai; love Kapaa; love Waipouli. Our location was perfect and, as always, the Remax staff was available, helpful and supportive. It would be so much nicer if regular maintenance checks were conducted and if furniture was replaced or repaired and cleaned more frequently. The Master BR mattress is a sagging bunch of lumps, very unpleasant. Hoping things will improve prior to our next stay. This property was exactly as described. Very cleaned and well maintained. Extremely convenient in terms of "check-in/check-out." I would definitely recommend and/or use again myself. We had 5 in our party (mom, dad, teenager and two college students). This was a great unit for us! We are an "active" family and this location gave us access to a major running trail, great hiking and waterfall adventures, fun beaches, and more! However, I could totally see myself using this place to completely chill and relax. It was quiet and peaceful out on the lanai. The pool/spa area was also fun to use (although the towel lady was a bit rude ;-) We didn't eat at the on-site restaurant, but it looked like a fun, well-attended place. Overall, a great place to vacation! We can't think of anything to improve upon! We celebrated our 25th wedding anniversary and were truly spoiled with our stay. The location was perfect and our room beautiful! 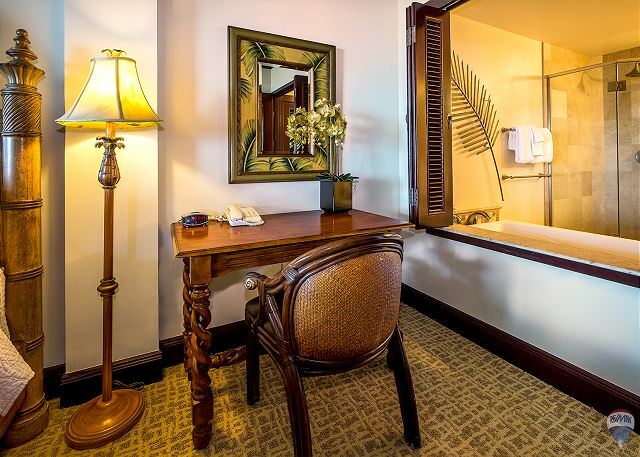 Beautiful room with a gorgeous stay! We saw this resort 5 years ago and knew it would be perfect for our return stay with our two children. The view from the room was stunning, the boys loved the pool and the restaurant on site is delicious. You can also walk to many restaurants and shops nearby. We had a wonderful stay at the Waipouli. The view from the patio took our breath away when we first walked in. The condo had everything we needed and we loved the location in Kapaa. We were close to both the North and South parts of the island. The grounds are beautiful and the pool area was so clean and we enjoyed the pools everyday. I can't say enough about how much we loved the condo and the resort. Beautiful condo and location. Very nice with all the comforts of home and was beach front! Georgia! Beautiful, well kept property and loved the room set up!!! All condos should copy this floor plan. It was perfect! Try the restaurant on the property.... the food was amazing!! Gorgeous view too. We really enjoyed this condo and would recommend it!! We have stayed at this property several times, but we were a little disappointed this time. Generally I'd say that some things have not been attended to. Missing simple things like a can opener and a cookie sheet. TV was not working, but they did take care of that. Overall I'd say the place could use a little TLC. The lighting in the master is one lamp. They were very inflexible on check in and check out times. Overall for the price we are paying to stay here I was not completely satisfied. I'll certainly look at other options next time. With that said, the view is great and the grounds are well maintained. Views are great! Love the property and all it has to offer. The bedding, sheets , towels , pillows are old and need to be updated. The cleaning crew was young and didn’t care if the pillows were badly stained yellow. They rushed in to do a quick clean, doing so they are not paying attention to details. We loved this unit! It's spacious, well appointed, and well maintained. We were traveling with our 7-year old daughter who loved having her own room, but this unit is also big enough for two families traveling together. There are three bathrooms! The oceanfront lanais are lovely. The resort is clean, well managed, and fun for kids! We will be back! Beautiful condo! Convenient location for exploring both north and south sides of the island. The swimming pool provided a nice break from hiking and exploring. The view is phenomenal. The only thing missing at this condo is a beach you can swim at, however the nightly rate would likely be double if this property also had a great swimming beach! We were very happy with our unit. The main area has plenty of room and a nice kitchen. The 3 balconies were a nice touch, with a great view of the ocean. Great condo, spectacular ocean views. Condo was well stocked and clean. Great pool for kids and grills were great for the bbq. Only small complaint would be the screens on the sliding doors were all in pretty rough shape and the freezer door was extremely difficult to open. Other then those small issues it was a great condo and a great time! 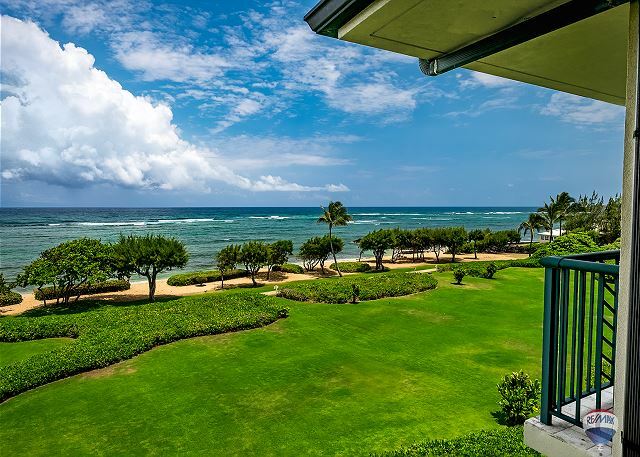 Perfect rental on the island of Kauai. Excellent location! Beautiful home with lovely kitchen and views galore. Would definitely return. We had an incredible time! This condo was perfect and exactly what we were looking for! 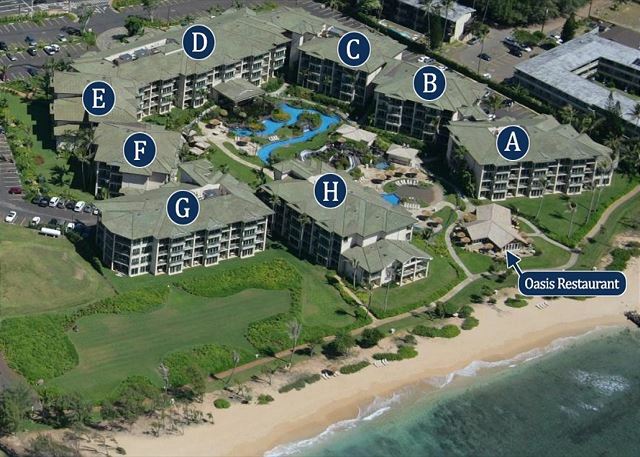 We loved being located in between the north shore and the south and west shores! The only down side was that we were told the wasters were too dangerous for swimming. Nonetheless we enjoyed the view of some gorgeous sunrises! overall it was nice. It was the attention to detail on some items that to others are not a big deal. 2. the freezer door would not open unless the refrigerator door was opened and fingers were placed into the gasket to separate. Remax personnel are very polite, helpful and responded to any needs promptly. 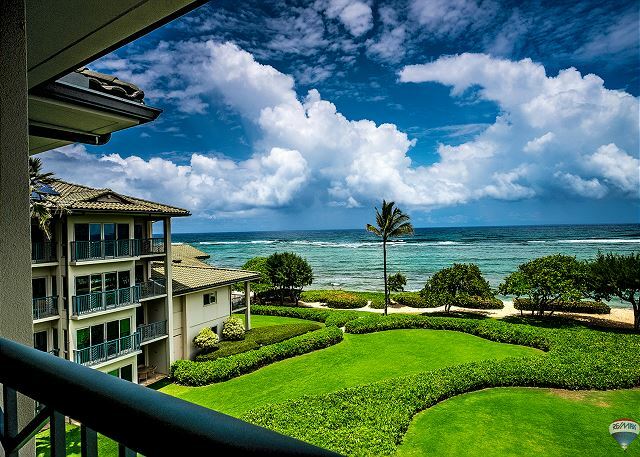 We had the most amazing vacation in Kauai and it was largely due to this stunning condo! We are a family of four and had so much room. The kids had their own room and bathroom. The living room was spacious and had comfortable furniture. The beds were comfortable. The kitchen was well equipped and the sub zero fridge was impressive. The view was incredible to wake up to each day and enjoy. The condo is located close to grocery stores and is in a nice central location on the island. The wave pool was a little underwhelming, that would be our only complaint. The pool was nice and the kids loved the water slides. With few exceptions this property is very comfortable and in an ideal location. It would be nice if the unit had beach towels. Also, the counters and glass dining table top were not as clean as expected. Other than these exceptions and the fact that check out time is a little early (10:00 AM), this is a prime rental. Very nice, centrally located property. We really liked just about everything about this condo, great location, great pool area, great view, nicely furnished and equipped. The only thing that is lacking is a good swimming beach, we knew that going in, but that would be the one thing that would put this place over the top. It was a great location for our first visit, right in the middle of everything made it easy for exploring both ends of the island. The access to the miles of ocean front walking/biking path was an added bonus. Would not hesitate to recommend to friends. The view from the condo was wonderful & that is one of the reasons we chose that unit. The pillows were TERRIBLE, the sheets could have been better quality. My neck hurt the whole time there, you shouldn't have to bring your own pillows when you pay that much money for a condo. There was only one tiny blanket that would barely fit the bed. I have arthritis in my arms & could not open the sub-zero refrigerator or freezer, my husband had to do it. The pool was wonderful. The rental at Waipouli was perfect. Our family of 5 was very comfortable. 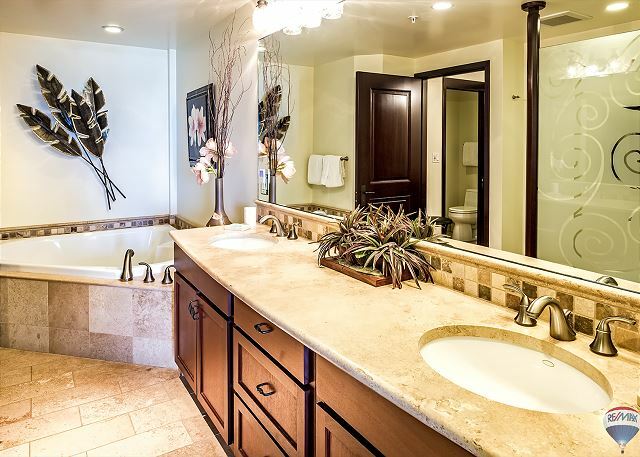 The unit was beautiful and located in one of the best spots on the property. The pool and some spas were lovely as well. The location of the property was easy access to the grocery and main roads for sightseeing. Only one complaint , the unit was missing trash bags and we could have used foil or plastic wrap. We would love to visit here again!!! We loved our stay at g404! The panoramic ocean views are incredible. 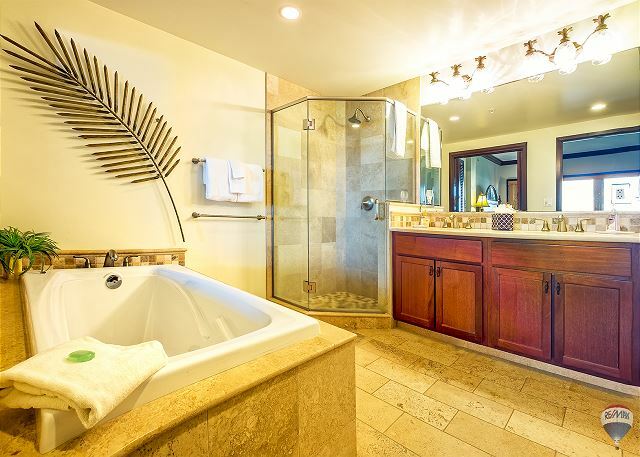 I would highly recommend this unit to anyone looking for luxury living with the convenience of Kapaa. My family and I stayed at this beautiful condo June 2017. The location was wonderful, the condo could use a little updating: Dusty plastic flowers, outdated worn bedspreads, uncomfortable sleeper sofa, could use an updated Smart Television (would of been nice after a long day of playing to login to our Netflix account and watch a movie) The location and view was the huge selling point of this condo, the resort was maintained and had a nice pool. Would recommend to friend and would stay again. 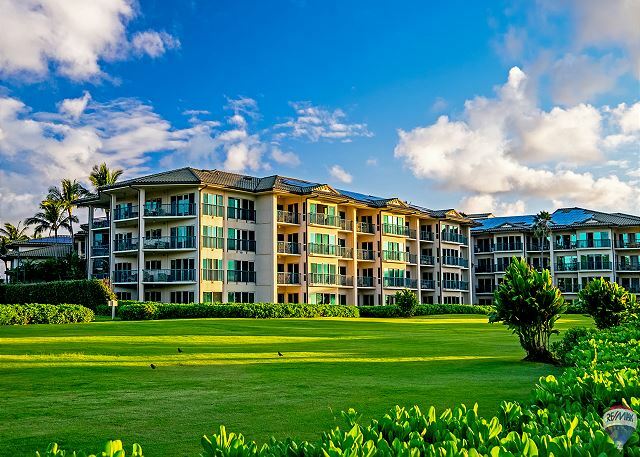 Love Waipouli Resort for the property, amenities and location. Overall, our stay went just as expected. The unit was beautiful and the surrounding property was also beautiful and nicely landscaped. G-404 is a great location on a very nice property. Having stayed here several times we have noticed the property needs a little TLC. The appliances needed some maintenance, lamps didn't work, there was no light in the bedroom and some of the utensils were broken. All considered it is still a very nice place. Very nice location, facility, and views. My husband and I just returned from a week long vacation at Waipouli Beach Resort. We had a fabulous stay there. The condo was beautiful and we couldn't have asked for a better location. All of the amenities were first class. 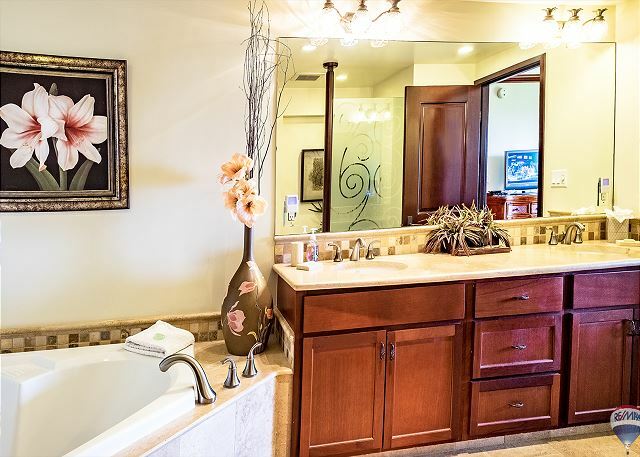 Wonderful kitchen (slab granite and stainless steel appliances including a very large Sub Zero refrigerator) luxurious bathrooms (soaking tub, tiled shower and spacious vanities) and lovely ocean views from all of the main rooms. The furnishings were pretty and of very good quality. The king bed was very comfortable but I would recommend the option of down pillows being available for guests as we find foam pillows to be too stiff. The linens and towels were also very nice and there were plenty available. Having a washer and dryer in the unit was very handy and we used them quite a bit. In general, the condo was the nicest I've ever stayed when on vacation. The resort is beautiful and was uncrowded this time of year. We enjoyed a couple's massage in the spa, rented bikes for the wonderful path that runs oceanside for miles, and ate out at the Oasis restaurant on site. Terrific price for happy hour cocktails at half price .One of the best deals at a very nice restaurant. The pool was clean and enjoyable too. Again, there were always plenty of chairs when we were needing them. We just really enjoyed our stay and would love to come back again and maybe even retire at our own condo there. We were very pleased with this property...view amazing, very convenient location, furniture comfortable, pool and spas great. Our family of four loved this rental! The ocean view is perfect and unobstructed. We enjoyed mornings watching the sun rise from the lanai. It is a quiet location in the resort but a quick walk over to the pool and restaurant. Condo had everything we needed, including beach chairs. Microwave/stove light needs to be replaced and there were a few other lightbulbs out in the unit, but nothing that hindered our vacation. Island location was great, centrally located for the drive to north or south shore. Our overall stay was good. Unit was clean, kitchen fairly well equipped, bedding great, and bathrooms nice. We did call for Maintenance and did not get a really fast resolution. Found the traffic at the light really bad if you were on foot. You waited forever to cross, not great for cars either. We received excellent check-in entry information by email and were able to arrive and go right into the apartment. A concern due to an unfinished bed, lack of bath towels and wash clothes, and a stack of linens by the washer dryer was immediately remedied. A message was left by phone to the customer service number. After calling we left the apartment several hours and returned to find all concerns addressed and a sincere apology. The managers caring for the apt were called away due to a death in the family. The next day we found a dessert and wine left for us. The remainder of the stay was excellent. Parking was easy, location great, view from balconies fantastic. The room was clean, beautifully appointed and furniture was attractive and comfortable. We were sorry we had such a short time to spend here. I would return in a heartbeat. Thank you for a wonderful experience. This is a great place to stay. Condo is in great shape. You have the pool, bar/restaurant and spa right there. You are in the middle between North and south shore and you will probably visit both. We are coming back to Hawaii in Sept and will probably stay here again. Loved this rental. The porch overlooking the beach was beautiful. Very pretty island, lots to do. Great Resort! Great Condo! Great View and Sunrises! Overall, we had a very positive experience. The location of the unit is great, with a beautiful view of the grounds directly below and the ocean just beyond. Perfect spot for sunrise in the morning. We enjoyed having the windows open and listening to the calming ocean during the night and having the more busy poolside on the other side of the building. The unit was well-equipped with all that we needed. Our kids really enjoyed the pools,and it was nice to have the pool/spas available after coming back to the resort after a long day's adventure. Having a restaurant/bar onsite that was beachfrong was a great feature. The location of the resort worked at well, as we spent equal amounts of time to the south (Poipu) and north (Princeville/Hanalei) and therefore never had too long a drive. My critique is that the hideaway bed used by my kids was very uncomfortable and two springs were missing causing a corner of the bed to collapse. Also, the lanai is fairly cramped and when sitting in the chairs the railing is at eye level, obstructing the view a bit. This unit is on the top floor of the G building. The G building does not have any view obstructions, which is very nice. 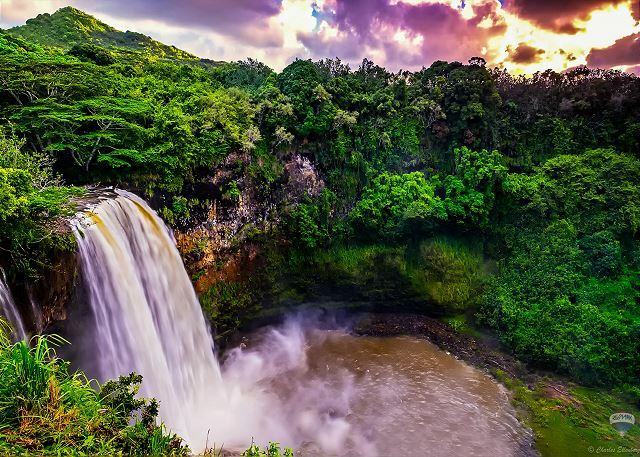 There is a natural preserve which gives the view a more Kauai waterfront feel to it. The grounds are well kept the landscapers were around making sure everything looks perfect. The pool, hot tubs, workout facility, BBQs were all in very great condition. The location is central for Kappa and Foodland/Safeway is right across the street. If you needed activity information Expedia Local Expert was down in the main lobby to guide you. The unit itself was amazing, it was fully stocked with all the cooking needs, the beds were comfortable, the bathrooms were large and very well designed. The TV’s in unit were all hooked up with DVD players. I really can’t say enough good things about this unit. The only issue I had was with the AC thermostat that when I left I would try to turn it off and would get stuck in Fan mode and was not turning off. To conserve energy I would suggest a new smart thermostat like nest or Honeywell. Loved our week there wish I could have stayed longer. The ReMax team is great and accommodated our late checkout. Mahalo! 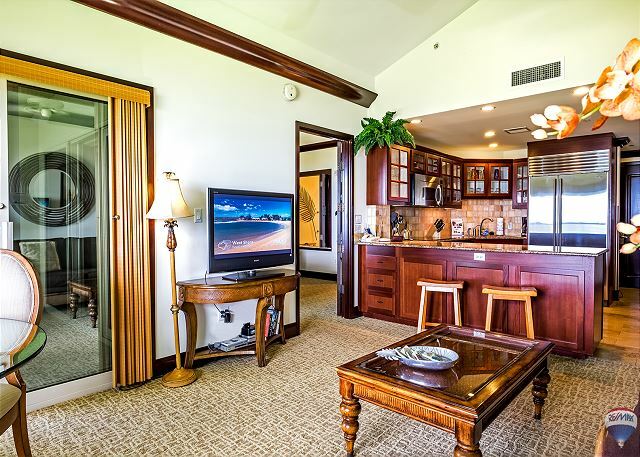 We really had a great experience staying at the condo located in the Waipouli Resort room G-404. The views were fantastic from the lanai and the sound of the ocean lulled us to sleep most evenings when there was a breeze. The condo was in good shape and offered us and our guests all the convenience of home. If there is one improvement I would make it would be the installation of ceiling fans in each bedroom. On the evenings when there was not enough cool air from the outside and we needed to operate the air conditioning the rooms became stuffy and uncomfortable. We enjoyed watching the whales jumping in the ocean which we could see clearly from our lanai. Being on the top floor looking out to sea spared us the noise from the pool area. Viewing the sunrise from the lanai with a cup of coffee was the best way to start the day. We would not have a problem recommending the room to others. A GLORIOUS WEEK IN KAUAI!!! The condo exceeded our expectations! Magnificent! Everything we needed was there plus more! It was beautifully decorated, immaculate, super spacious and very comfortable. The grounds of the resort were spectacular and the pool was sensational! My only wish was that we could have stayed longer. We will most definitely return to our Island Paradise by the sea. 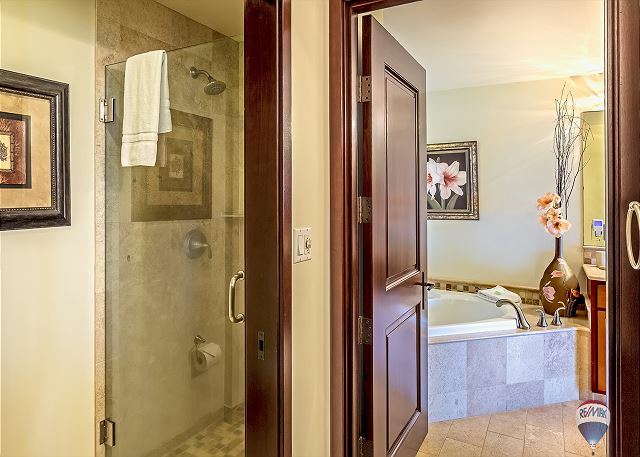 This unit is fantastic for any couples / families who want to be on a resort, but still have the feel of privacy and quiet space. This unit faces directly to the East side of the island allowing for beautiful sunrises to be seen (although cloudy at times). My wife and I would definitely rent this unit again without a doubt! Wow! First time we've rented a place and been so pleased. It was better than we expected in all ways. 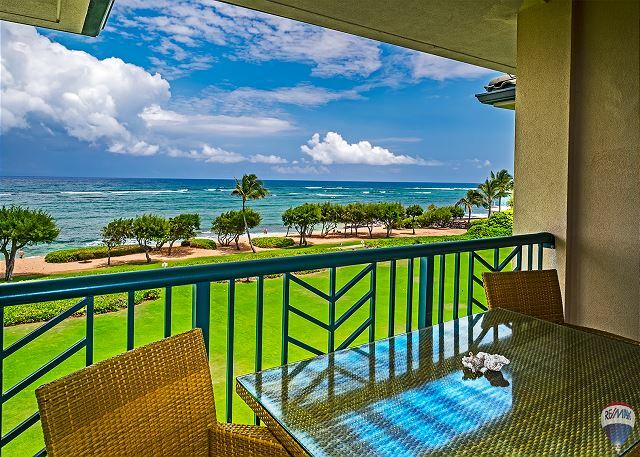 The property was in a great location (half way between Poipu and Princeville);the view was what was promised;the unit was spacious, clean, well equipped and had nice furnature and decor; the pool area was beautiful and the pool was always clean. The restaurant onsite was so convenient and had a good menu. 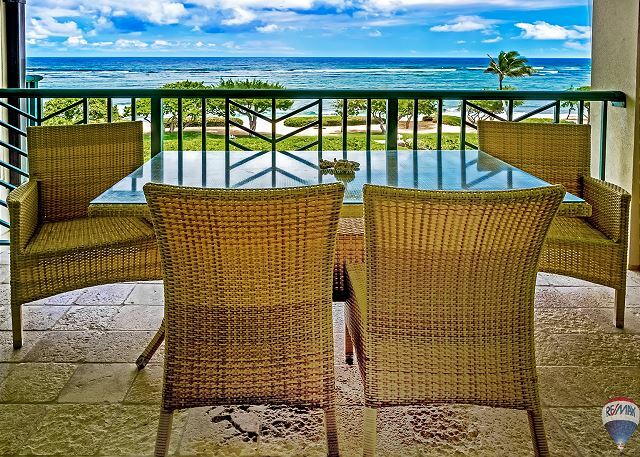 Nicely decorated condo with great views of the ocean from both bedrooms and the living room. We will definitely try to stay in this unit again. The property at this resort was quite and relaxing. We are looking forward to returning to this resort because of the quite surrounding and polite people in Kappa. Still a very nice place to stay! The property is still very nice, but there are a few things that need to be taken care of. We have commented over the years that the A/C doesn't circulate well when the bedroom doors are closed. The rooms get very warm when the doors are closed and this is still an issue. The property also experiences power surges which are common in this area so some appliances needed repair. The property management was good at addressing the TV going out, but the oven and stove are in need of repair. Even with these minor issues this is a great place to stay and one of our favorites! We will definitely be back. Outstanding property! We will definitely be back. Re/Max Kauai was a very professional and a joy to work with. The condo was perfect in every way. However, when you are at this price point a usable pool should be a given. The pool was so cold even the kids wouldn't use it. I will never book here in the winter months again but will always book during the warmer months. The condo itself was very nice, fabulous kitchen. The view was amazing. Having our meals outside overlooking the ocean made for great family times. My only suggestion would be to install ceiling fans in the bedrooms. The spa was a little pricey but worth every penny, 2 facials and 2 massages, 700.00. This is the real deal when it comes to beach front....nothing between you and the beach except some palm trees. we loved the view and the fact that we were on the fourth floor. Beautiful sunrises. The condo is very nicely decorated with ample room for our family. The top-of-the-line kitchen made it easy to throw together a nice breakfast or snack or lunch if we didn't want to eat out, especially since Safeway is just across the street from the resort. Our kids (14 and 10) loved the pool - just wish it had stayed open a little later than 6 PM. Good location for access to north and south shores. Room was excellent, views were outstanding. Location was amazing. Wonderful property and location. Only comment would be to add ceiling fans in both bedrooms (although there is a tower fan available in the king bed room. This would also help reduce the air conditioner use. We had a great time again and plan to return. We cannot wait to go back to the very same unit! Thank you! This is a beautiful property and incredible location. I highly recommend this particular property. The condos are exceptional. Four adults and a two-year-old fit comfortably with room to spare. 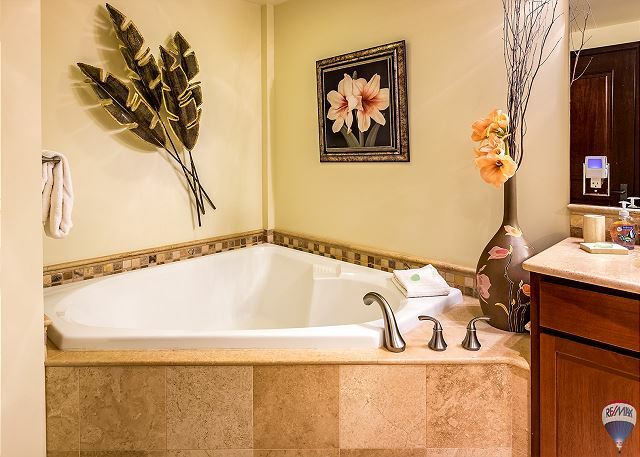 The amenities and furnishings are beyond compare. Highly recommend for families with the kid-friendly pool. Probably not great for honeymooners because of the number of kids. Laura L from Samamish, WA does not recommend this vacation rental. Our first unit the furniture was worn and dirty. THe a/c unit broke and we had to switch units. Of course, that was on the other side of the property and it took quite some time to pack up all of our food and clothing and drag it over and then unpack it all again. Our 2nd unit was much better as to the quality of the funiture, but not as good a location. 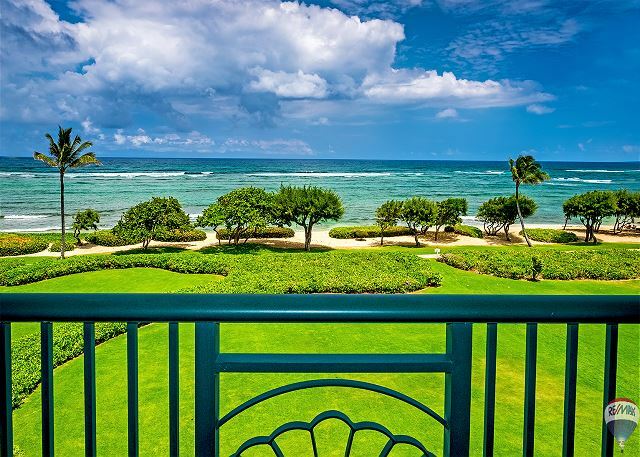 We paid a lot more to be in the front corner unit with a wrap around view and lanai and felt a bit ripped off by RE/Max at getting moved to a lesser view unit and no offer of compensation. We could have rented numerous units at a lesser cost and equal view to what we paid for the corner unit and then ended up not getting to be in. I felt helpless. Either take a lesser unit or sit in a non airconditioned unit and deal with it. Thank goodness for our house cleaner Deani. She saved our trip. Without her help on numerous issues including finding a new unit when our A/C broke, the trip would have been much worse. This was our third trip to Waipouli and we have always travled with at least 4-5 other families each trip. I am almost positive we will not come back to Waipouli Beach Resort in the future. Our family group of five had a great stay in Kauai! 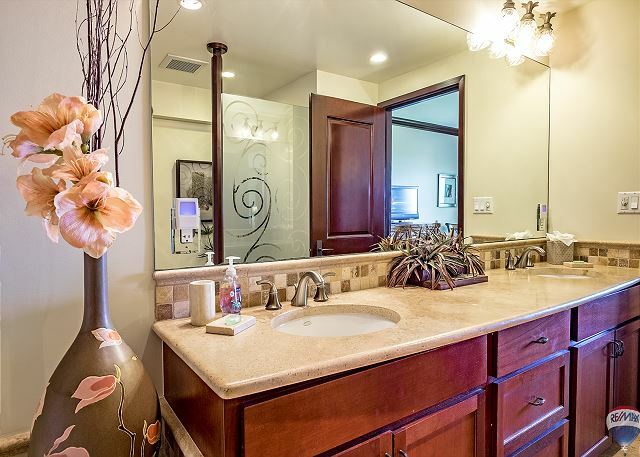 The property was the best as far as amenities and quality of construction and cleaniness go. Our only possible complaint would be the size of the lanai area...just too small to be enjoyed. Otherwise, a wonderful visit. Management allowed us to check out late on our last day. This was a big help to us because we had a 11PM flight back home. We will definitely recommend the property to our friends. The condo was very nice, centrally located on the island & very convenient to shopping (directly across the street). We enjoyed being able to go grocery shopping or having takeout restaurants directly across the street. 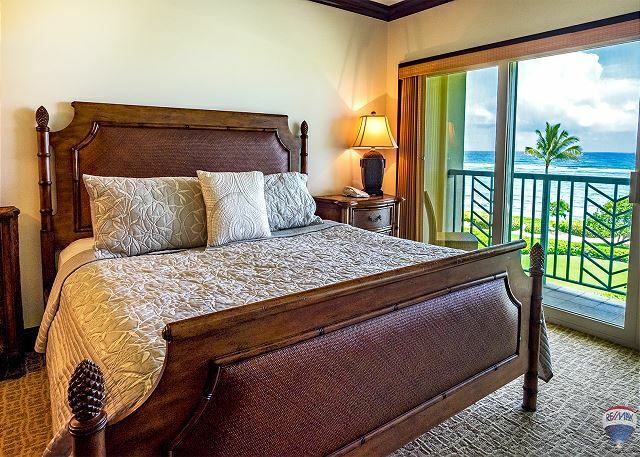 I spent many hours researching where to stay on Kauai and kept coming back to this rental before committing. I must say that the facility and condo were fabulous. The location of the complex was ideal in that it is convenient to the northern and southern end of the island. Remax was a breeze to work with...we'll be back! Our family had a great time staying at your resort. The condos were absolutely beautiful. 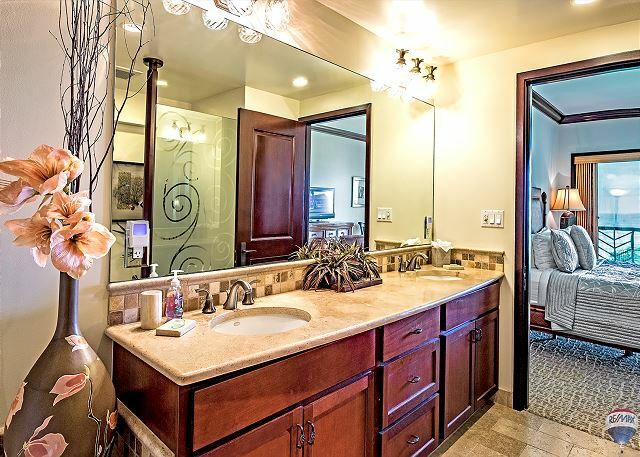 -Need more towel racks, e.g. for hand towels in bathrooms. -The card keys only work once or twice and die and it was a hassle to get new ones--major pain throughout stay. -Need some better beach chairs and more. -Bedding would be better as duvets and comforters..
-The master bath shower leaks out of shower door terribly. We had an great time at our Wailpouli Luxury Condo. This resort and condo is second to none. The grounds were amazing and the high quality of the maintenance program shows through in every aspect of this resort. We had a problem with the dishwasher, but the we received a prompt and cheerful response to our problem. This unit was ideal. Our November 18-21 visit was at a time that is traditionally slow which suited us very well. The resort is beautiful and the unit wsa truly incredible -- certainly the nicest rental unit I've ever seen. It was like being home. Staying on the Coconut Coast was really the ideal location. It made the drive up to Princeville/Hanalei or down to Poipu much easier (as opposed to staying on either end of the island and having to drive much further around). They say that there is no good beach on the Coconut Coast, but Lydgate Beach Park was perfect! It's only a 5 minute drive from the condo, has easy parking, has a lifeguard, bathrooms, showers, and a playground! Perfect for families with children. The condo itself was ideal. It's beautiful, spacious, and has an excellent pool with 2 waterslides (perfect for your kids). We definitely plan on staying there again. We did feel that the check-in process could have been a bit more streamline. When we arrived, the front desk people didn't know anything about us (since we're renting the condo independently), and they didn't know who to call. Fortunately, we arrived during normal business hours, so were able to call the ReMax offices. The agent was very kind, but also didn't know EXACTLY how we're supposed to get our keys. We were instructed to use a house phone in the lobby, but she didn't know who to call. Eventually someone from ReMax called housekeeping who walked down our keys. Perhaps in the future there could be a better way for guests to get their keys/parking permit, especially if they arrive past normal business hours. Also, we purchased liquid hand soap (all the liquid soap dispensers were empty). Also, I believe beach towels were listed as an item included (penalized if you took them), but we found no beach towels in our room. Lastly, we purchased 2 beach umbrellas and 2 beach chairs and left them in the closet for future guests to use. These are essential items for the beach and not easily transported via plane. Perhaps all the rooms should be stocked with some. Overall we had the best time staying at these condos and can't wait until our next trip there! a guest from Santa Cruz, CA does not recommend this vacation rental. I'd stay at this property, but not with RE/MAX. They don't stock the unit with enough toilet paper or paper towels and refused to provide me with more even though they charge top dollar. They had a huge attitude when asked. I have stayed in rentals all over the world and multiple times in Hawaii and have never been denied toilet paper or paper towels. Their check out time is 10 AM which is ridiculous considering their check in is 4 PM. They also were very misleading regarding their check-in telling me to go to their office which was closed instead of to the property directly. They do not supply daily maid service like Outrigger either. Lastly, they charge way above market value in this time in the economy. 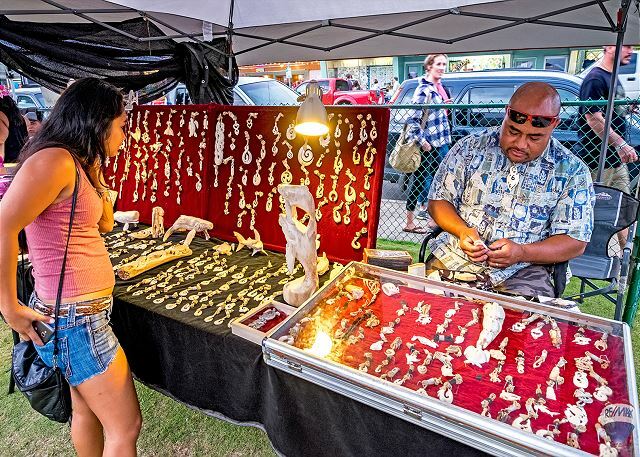 They offered no deals or discounts, and private owners or Outrigger are the way to go. Renting from Private Rental Companies is much different than renting from hotel/condo-tel set ups. The Segelman party was given a 10% discount and the $75.00 security fee was waived in lieu of paying the travel agent company a 10% commission. As with most privately owned and managed rentals they are stocked with starter supplies and daily maid service is not included. Daily maid service can be added for an additional fee. Our contract and direction letter clearly state check in time is 3:00pm and check out time is 10:00am. We are happy to extend complimentary late check outs when bookings allow. As with all private vacation rentals you are CONFIRMED in the specific property you reserved. There is no "pooling" system in which it is a surprise what room you get. You know exactly what property/or Condo number you will be staying in. This reservation was made on 3/7/08, the Segelman party was confirmed for this fabulous OCEAN FRONT two bedroom three bath condo. 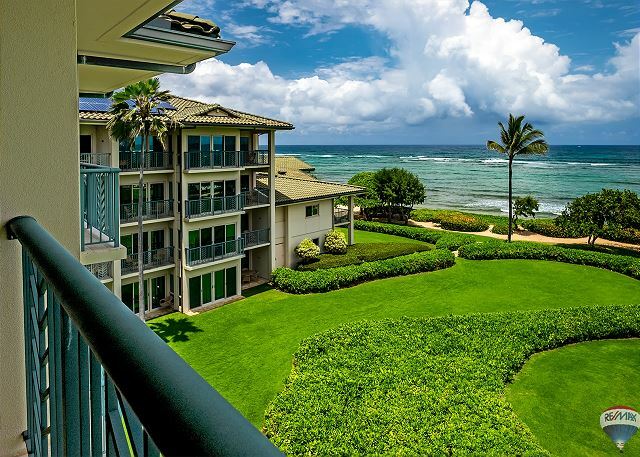 The nightly rate offered by RE/MAX Kauai for this condo was $429.13, all taxes and cleaning included. 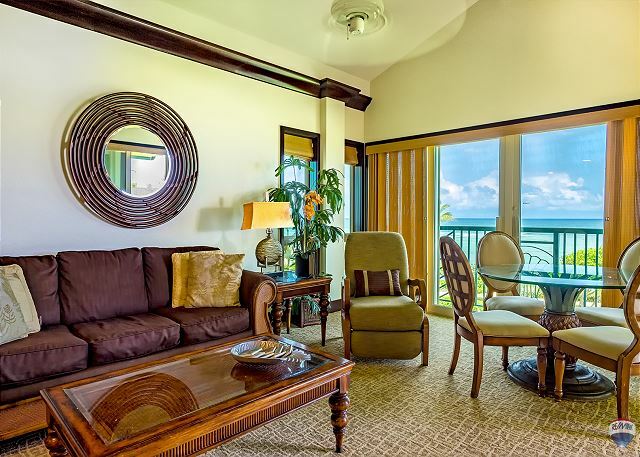 The nightly rate through Outrigger for the same room category….$700.81!! Of course this additional $271.68 per night will give you daily maid service and unlimited toiletries. 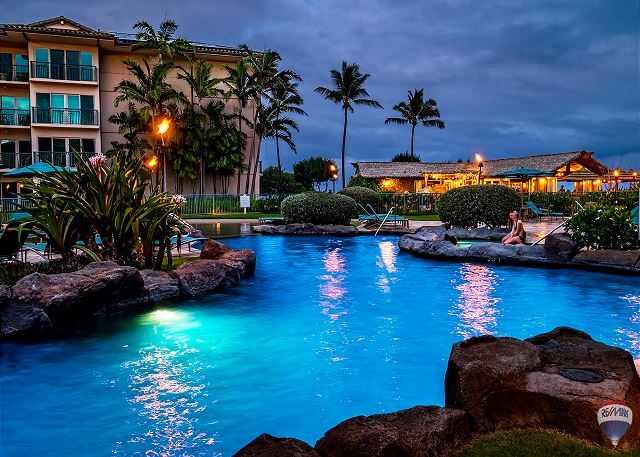 The nightly rate for a 4 person, ocean front hotel room at the Grand Hyatt Kauai during the same time period is $1,113.05.Since we are able confirm bookings a year in advance we guarantee you will pay the contracted rate. We will never raise nor decrease a rate. The request was made a couple weeks prior to check in asking for a lower rate due to the economy. Since the reservation was made 4.5 months prior the condo was hence unavailable on the open market. We would never raise a contracted rate on any incoming guests for any RE/MAX Kauai we strive to keep our rates competitive and fair. Customer service is of the highest priority. We are sorry to hear of the Segelmans disappointment. One issue with check in as a private rental in that the resort did not have our name or length of stay when we arrived. Quickly remedied by Remax. We had 2 condos in the G building for our large family. The condos were very spacious, beautifully furnished, included all top-of-the-line modern appliances, and wonderfully clean. We had an unobstructed view of the ocean and a virtually private beach with beach chairs and umbrellas for our use free of charge. The Tiki bar was great for happy hour every day. The pool is very unusual. We really enjoyed the waterslides and sitting under the pool waterfalls. The location was ideal and easy to find. Groceries, restaurants, etc. are within easy walking distance. We highly recommend this property for anyone. Mahalo for your review. We also offer a 5%-10% discount for returning guests!! We rented 3 units at Waipouli for a family reunion. What a wonderful experience for every age that came. 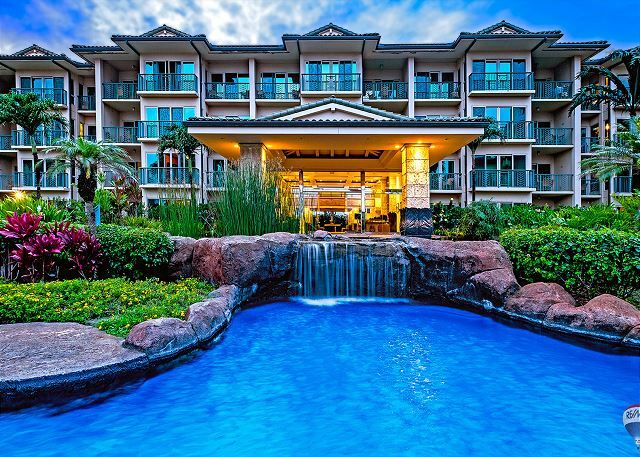 When we return to Kauai we will not hesitate to book once again at this resort. We had a 5 night stay in unit G-404, breathtaking views. The unit was exactly as it appears in the photos. Top of the line appliances in the kitchen and laundry. The folks at Remax couldn't have been nicer. The property was beautiful but we found the other guests very unfriendly. The bar looking out of the beach was wonderful, the pool area had a few too many kids but we still enjoyed it. Take a walk on the beach at low tide, there are many tidepools that are great for exploring. I would recommend this place to a family visiting Kauai. We went off season in April and there were no crowds anywhere, traffic was never a problem. If you go to Waimea Canyon be sure to go up early before the clouds settle in and eat at the Shrimp Station in Waimea the best meal we had, cheap and delicious! We loved everything about the resort except the size of the fitness room. It was very small for such a large/nice resort. Otherwise, we were very pleased with our stay. Towels in our room were washed by us and they continued to have a smell. I did know if the water in the washer was hot enough to really clean them?? Drop dead gorgeous condo and views!! We stayed for a week over Christmas holidays and the condo was perfect. The furnishings were first class, the appliances were first class, there is not one thing I could complain about except possibly the staff. Rumor had it that they were understaffed and it showed in their attitude but for the most part we didn't have to deal with them much so it didn't hamper the great time we had. The Condo was absolutely beautiful! We loved everything about our stay except the fact the bar / restaurant stopped serving food too early. The condo itself was amazing and the views breathtaking....perfect! We have vacationed at many places and the accomodations here were among the best we have experienced. We felt like we were in the center of everything without feeling like we were crowded. I would highly recommend Waipouli. our unit was beautiful and well equipped. we barbecued shrimp down by the pool and ate dinner in our unit. beautiful moonsets. would come back again. loved the pool and the frogs singing in the marsh.